The Challenge Of Betting On A Scientific Idea : 13.7: Cosmos And Culture In taking sides for or against a theory, scientists place their faith on an idea. Commentator Marcelo Gleiser asks what happens when the idea can't be tested or validated. Is it still science? 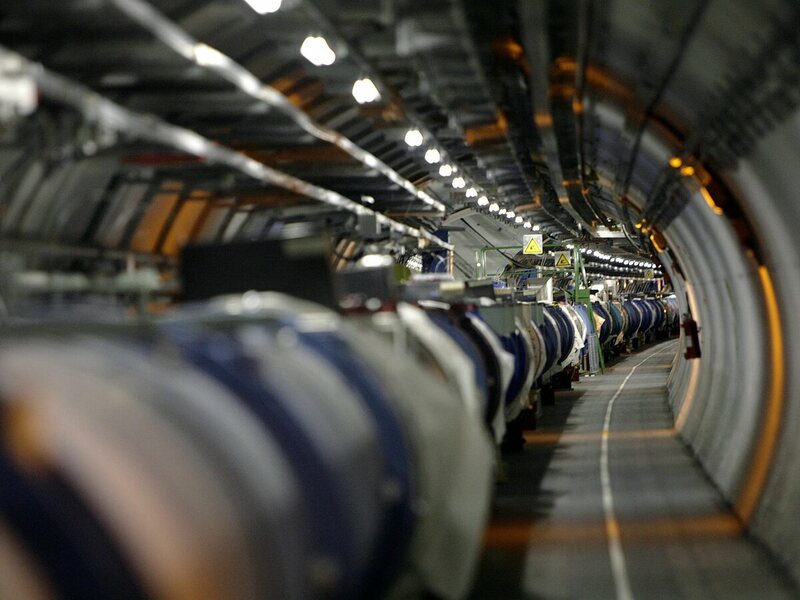 A view of the Large Hadron Collider in its tunnel at CERN in Switzerland. Given that science is believed to be about certainty, betting on a scientific idea sounds like an oxymoron. Yet scientists bet on ideas all the time, even if mostly for jest. Of course, this only makes sense before we have any data pointing toward the correctness of the disputed hypothesis. In the natural sciences, as we know, the final word always belongs to nature. We may have an idea that we find enormously compelling, so beautiful that it must be right. We are convinced of it, can swear by it. But nature couldn't care less for our aesthetical values and would toss aside with unnerving indifference an idea that many regard as beautiful or probably right. There have been a few famous bets in modern physics, the most popular ones involving physicist Stephen Hawking. One of his older ones was with Caltech astrophysicist Kip Thorne, on the existence of black holes. This was 1975 — and Hawking bet against it — not because he didn't believe black holes existed, but as a consolation prize just in case they didn't. He later (and I'm sure gladly) conceded the bet, and "paid the specified penalty, which was a one-year subscription to Penthouse, to the outrage of Kip's liberated wife." Readers of 13.7 may have noticed that in my post last week, I mentioned that I was going to contact my friend and colleague Gordon Kane, from the University of Michigan, and step up to bet against the discovery of supersymmetry in the next run of the Large Hadron Collider (LHC), the behemoth particle accelerator that found the Higgs boson in July of 2012. "To have a meaningful bet the LHC has to work at an appropriate energy and luminosity. It is expected to take integrated luminosity of order 300 fb-1 at a total energy near 13 TeV in the next run, in less than two years after turning on in early 2015. Assuming those results, signals for gluinos and/or light neutralinos and/or charginos are expected, and that's the appropriate bet. 15-year-old Macallan sounds good. Our paper that makes numbers firm rather than speculative is [here]. Assuming you're happy with this version, let's go ahead." Translating, Kane is happy to take on the bet if the LHC performs at an acceptable level — that is, powerfully enough so as to be able to generate the supersymmetric particles. This means an almost doubling of collision energy between protons (the collider makes bunches of them run against one another in clockwise and anticlockwise fashion) and a more efficient bunching of the particles to increase the number of collisions. These are well within the expected goals for the LHC. The strange names with "inos" at the end are the hypothetical supersymmetric particles — that is, particles that should exist if supersymmetry is indeed a symmetry of nature. Let's pause and appreciate what's going on. Supersymmetry is a powerful idea, proposed in the mid-1970s to alleviate certain problems plaguing particle physics. Skipping the details, it predicts a doubling of the number of elementary particles, the building blocks of matter. The lightest of those should be seen in particle collisions, at least in the simplest models. But the search for supersymmetry is the search for a much bigger goal, a unified theory of all forces of nature. The "super" in superstrings comes from supersymmetry. As I argued in A Tear at the Edge of Creation, and more recently in The Island of Knowledge, such dreams of final theories are compelling, part of our age-old culture of finding simple, unified views of the world. I once was a "believer," but have left that dream behind. Not because I don't find it beautiful or compelling, but because I have developed a different way of thinking about nature and about how science is done. After analyzing the symmetries that guide much thought in fundamental physics, I came to realize that they are mostly very useful approximations, ways of organizing information we gather about reality. Nature is generous in that it is often OK to neglect the details and focus on the approximate shapes and motions of objects. In some cases, the symmetries are real or very nearly so. But when it comes to the forces of nature, they are not so compelling as we are made to think. Even the equations of electromagnetism, the stalwart of unification, only display their beautiful unity between electricity and magnetism in empty space; put in charge or magnetic sources, and the beauty gets compromised. Still, it is amazing that theories may predict what is real, in the sense that we come up with a hypothesis, solve equations and come up with a particle that belongs in reality. This has happened over and over again — the Higgs boson is a good example — and gives confidence that some of our ideas are actually right. The problem with supersymmetry is subtler and more troubling. If Kane is right and evidence is found at the LHC, wonderful, we will all celebrate, and he will get a nice bottle of malt whisky. But what if evidence is not found? Will supersymmetry be discarded? This will be a very interesting test. My guess is that there will be a split in the community: Some will say enough is enough, and move on to new ways of dealing with the problems of particle theory; others will simply claim that the absence of evidence is not evidence of absence — that supersymmetric theories can be tweaked and tweaked, so that their particles are well beyond the reach of the LHC or any future machine. Supersymmetry is the kind of theory that can only be proven correct (by finding evidence for it) and never be proven wrong (as evidence may escape us). But here is the rub: If you have a theory that you believe in fervently but cannot be proven to be correct by data, what are you doing, exactly? What is the use of a scientific hypothesis that escapes validation? This is the real question, and will be very relevant in case Kane is wrong. I can't wait to see what happens.